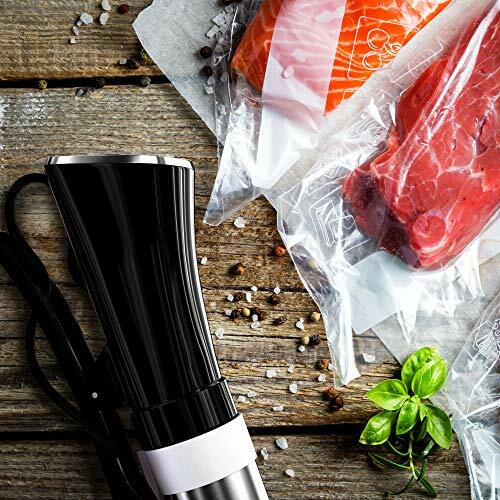 The sous vide method has become increasingly popular not only to professional chefs but also among home cooks. This cooking technique allows you to cook many different types of food to an unbelievable precision that you may never want to use another method of cooking again, ever! Food cooked using the sous vide method is never overcooked and is always at the perfect doneness and temperature. That’s because it uses precision temperature control in a water bath. You need one simple equipment called a sous vide machine to do this. 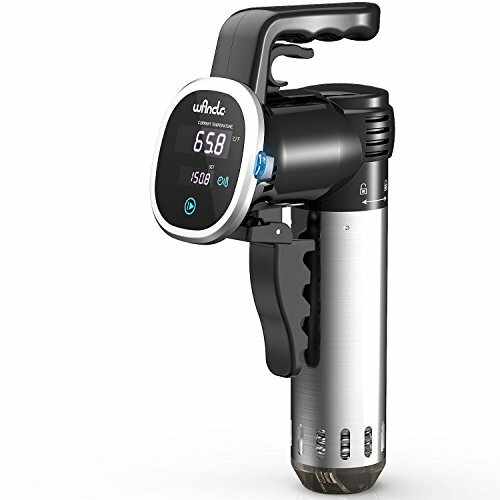 A basic personal sous vide cooker looks a lot like a hand blender, except instead of blades, it has a metal body which produces heat and usually has a digital control screen at the very top. The more advanced machines meant for professional use are similar to electric pressure cookers on the outside but have metal racks on the inside to hold the food in bags. There are a few varieties of these sous vide machines and they have their own unique advantages. A basic personal sous vide cooker can cost anywhere from $40 to $190, depending on the features and included accessories. Aside from the main unit, you would also need a sous vide container which you will fill with water. Most of these are also called sous vide immersion circulator. They are portable and can usually be operated with one hand. They may require batteries but some of them include a chord that you can plug on a wall socket. The process is simple. You create a water bath in a container and immerse the home sous vide machine in the water, leaving out the handle or the head. If there is an included sous vide container, there is usually a slot which holds the machine in place. Sometimes, the sous vide machine is designed with a clamp which you can simply clip on your pot or container. You place the meat or vegetables that you want to cook in a resealable plastic bag and submerge it into the water bath. The temperature settings can be adjusted via a small digital screen located on its head or handle. You can set the timer, your desired temperature, and other settings that the unit may offer. The sous vide machine will now heat the food to a perfect temperature. All you have to do is wait. No oils, no flipping, and no fears of overcooking. The more advanced cookers on the other hand or restaurant sous vide machines have the heating element integrated inside the cooker. They look like pressure cookers or rice cookers, and come in different shapes and sizes. Some of them are multifunctional and can also work as slow cookers. These are sometimes called sous vide ovens. Inside the cooker, you will find a set of stainless steel racks which can hold multiple foods in vacuum sealer bags at once. You fill the cooker with water, set the timer and temperature on the control panel in front of the machine, cover the pot, and you’re good to go. These models are best used when cooking for more people that’s why professional chefs prefer them over the immersion type sous vide cookers. They are surprisingly in the same price range as most of the home sous vide machines. If you often entertain a lot of guests, this may be the better choice for you. Restaurant sous vide machines or sous vide ovens are ready to use. No set up or preparation required. All you need are your plastic bags or vacuum sealer and water. Immersion circulators or home sous vide machines are more versatile because you can place them in any container whether small or big and food will cook just the same. So those are the most important things you need to know when trying to decide whether you need a home sous vide machine or a restaurant sous vide machine.